A great resource for fashion and creative professionals is Trendstop.com an online fashion and trend forecasting agency based in London. They have an extensive data for forecasts and trends in all areas of clothing, accessories and beauty for Mens and Womens. You can shop for all of their trend reports in our Trendstop shop here. 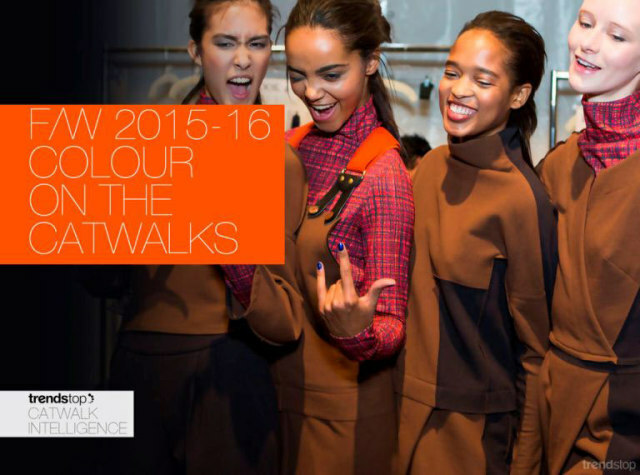 The Trendstop experts have analyzed the must-have shades of the season, compiling them into an inspirational spectrum of Fall/Winter 2015-16 color. Fresh from the front row, a sneak peek at a key color for the womenswear market: Cayenne. Image courtesy Trendstop: Costello Tagliapietra Fall/Winter 2015-16. Fresh from the front row, discover how womenswear can be updated with Cayenne, a directional shade, that colors designs in the apparel, accessories and footwear sectors. Cayenne will be influential for fast fashion markets going into F/W 2015-16, as well as mainstream fashion markets for Fall/Winter 2016-17 a season later. 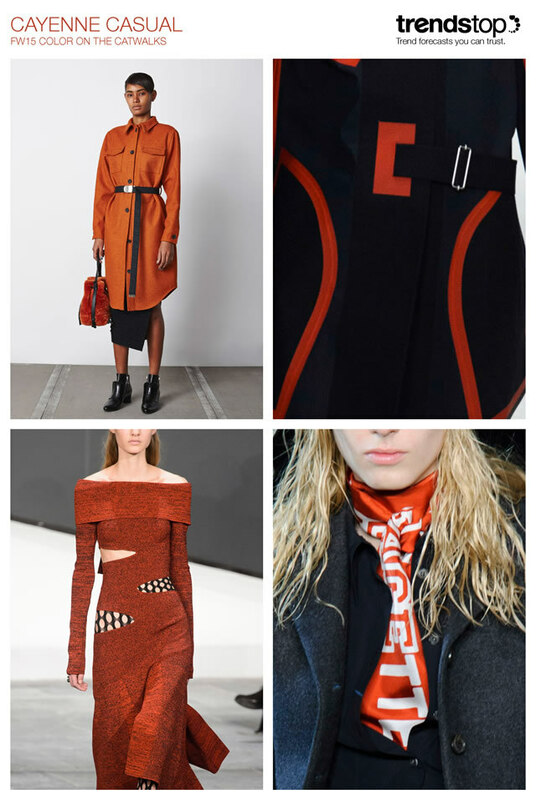 Image courtesy Trendstop: Opening Ceremony, Lacoste, Proenza Schouler, Marc by Marc Jacobs, all Fall/Winter 2015-16. A spicy shade of Cayenne combines brown with an orange tint, updating the staple shade with an autumnal Fashion Colour twist. A perfect shade for the fall wardrobe, Cayenne injects women’s styles with an alluring warmth and commercial appeal. In casual wear this color adds a laidback look to pieces like utility coats at Opening Ceremony and manipulated dresses at Proenza Schouler, while sportswear inspires contrast trim at Lacoste and slogan scarves by Marc by Marc Jacobs. Images courtesy Trendstop: Cushnie et Ochs, Zac Posen, Adeam, Proenza Schouler, all Fall/Winter 2015-16. An influential shade on the New York runways, designers demonstrate how Cayenne can be applied to luxury-based fabrications for a more sophisticated feel. Lurex fibres and silks create elegance in the form of ladylike dresses at Cushnie et Ochs, with monochrome color contrasts adding interest to winter layering at Adeam. 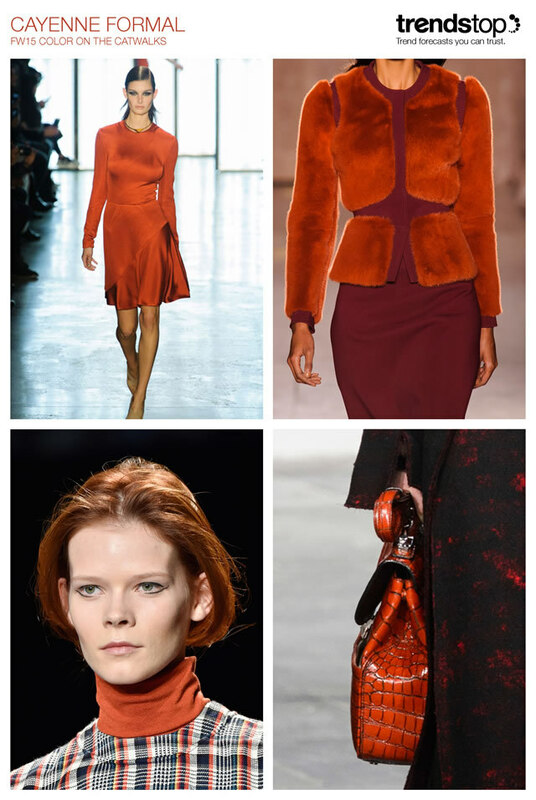 Other highlights include plush fur jackets at Zac Posen and glossy reptile skin handbags at Proenza Schouler. The full report is available now, shop at our Trendstop shop, here.